Itʻs Joe Jaffeʻs 95th birthday today, and he and I reminisced about our many adventures this afternoon. Joe is a physicist, scientist, and entrepreneur who dedicated his life to making the world safer for the next generations. As a young physicist at Smith Kline in Philadelphia he convinced the management team to start a biomedical division, which he headed as Director of Instrument Research and Development. There he pioneered, developed and patented technologies that have saved many lives, including early diagnostic ultrasound imaging systems and the first commercial doppler fetal pulse detector. This was after Dr. Alice Stewart found that en utero x-rays were contributing to excess childhood leukemia rates in Great Britain. Ultrasound imaging pioneered by Joe has almost completely replaced the use of x-rays on pregnant women. Prior to Smith Kline, Joe was on the team that developed the bazooka, and he went from there to telemetry projects at NACA (the predecessor of NASA). Later when President Nixon opened the door to China, Joe led one of the first scientific and industrial delegations into Beijing. He came out and provided many of us the first glimpses of Chinese medical devices and practices of that period. Joe left Smith Kline to start Products and Processes, and I met him at that phase of his career. We partnered on some doppler fetal pulse detectors and he loaned me money to start the instrument division of SE International, where we, with Steve Weiss and a talented team, developed some interesting radiation detection instruments including an early hand held low power device called the Monitor 4. This was during an age when geiger counters were typically large and bulky, with poor battery life. When our team left SE and formed IMI – International Medcom, Joe became our physicist, Chairman of the Board, and a key contributor to many radiation detection instruments including the Radalert, Radalert 50, Radalert 100, Digilert (licensed to SEI), the Geiger, the Gateman (for border security), the Inspector, Inspector Alert, and advanced radiation monitoring networks for communities. During that period IMI introduced the first real time data on the world wide web, in a GIS format for the Three Mile Island Community. The Gateman was the first instrument deployed at borders in Russia, Kazahkstan, Belarus, to prevent smuggling of nuclear weapons and materials. It was part of the Nunn Lugar Mutual Threat Reduction Regime. This was during a very dangerous period of transition in the former Soviet Union, when nuclear scientists werenʻt getting paid and the stockpiles of nuclear materials were not secure. Joeʻs statistical calculations and mathematical formulas contributed to a successful design that could detect as little as 10 grams of moving weapons grade uranium at a border crossing. Joe was also an architect of the licensing agreements to share technology with SE International. One of those agreements allows SE International to produce a version of our Inspector under their brand name. This was in support of the friendships that were in place between the companies: Joe’s commitments and priorities include honoring friendships, creating healthy communities, protecting the environment, reducing the risk of nuclear war or nuclear accidents. Joe didn’t need to work after he retired from Smith Kline, but he told me on many occasions that he wanted to do all that he could to create a safer world for his and other’s grandchildren. Joe and I worked closely with Dr. Karl Morgan to develop a community monitoring program around Three Mile Island, and we also deployed systems around Seabrook and Pilgrim reactors, to serve communities in those areas. Joe had a dream of a worldwide radiation monitoring network, so that data on radiation in the environment was transparent and available to all members of the world community. His dream is becoming a reality through the work of another project we are actively supporting: Safecast. After Fukushima we were able to provide instruments that contributed to the publishing of 3 million data readings in the first year since the disaster. In the early days of the disaster instruments Joe contributed to, significantly the Inspector Alert, documented the high radiation levels on playgrounds and school yards that were still being attended. Joe has occasionally said that he went into physics because that realm was more predictable than the human realm. But despite the occasional problems dealing with the human world, Joe has remained a humanitarian and the world is a safer place because of him. Thanks to Joe, millions of pregnancies have been managed without the risk of en utero x rays, and high quality radiation detection instruments have served numerous communities from Chernobyl to FDNY post 9/11, to the community surrounding the Three Mile Island nuclear plant, and the people of Fukushima. We’ll never know what tragedies may have been prevented by technologies and mentoring that Joe has provided over his 95 year lifespan, but I do know that the positive impact by Joe in my world and the world of communities IMI serves has been significant. Iʻm grateful that Joe took the time to mentor and help me when I was a young man, and to dedicate his life to creating a safer world, and I wish him a very happy birthday! 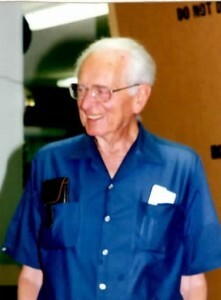 Joe retired from his post as Founding Chairman of IMI – International Medcom at age 90, but continues an active interest in the affairs of the company and the world from his home in San Jose, California. He remains our Chairman Emeritus.